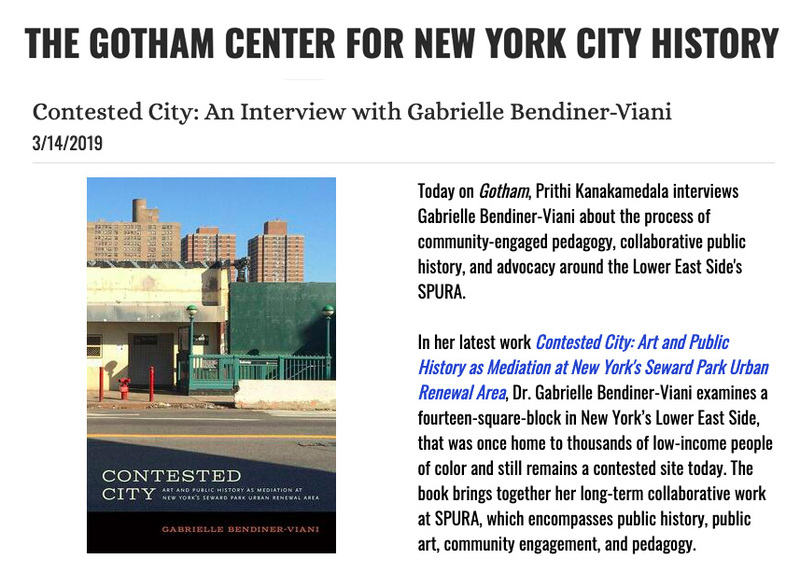 Such a pleasure to be interviewed about Contested City by public historian Prithi Kanakamedala for the Gotham Center for New York City History. Read an excerpt of our conversation below - or read the whole thing here. 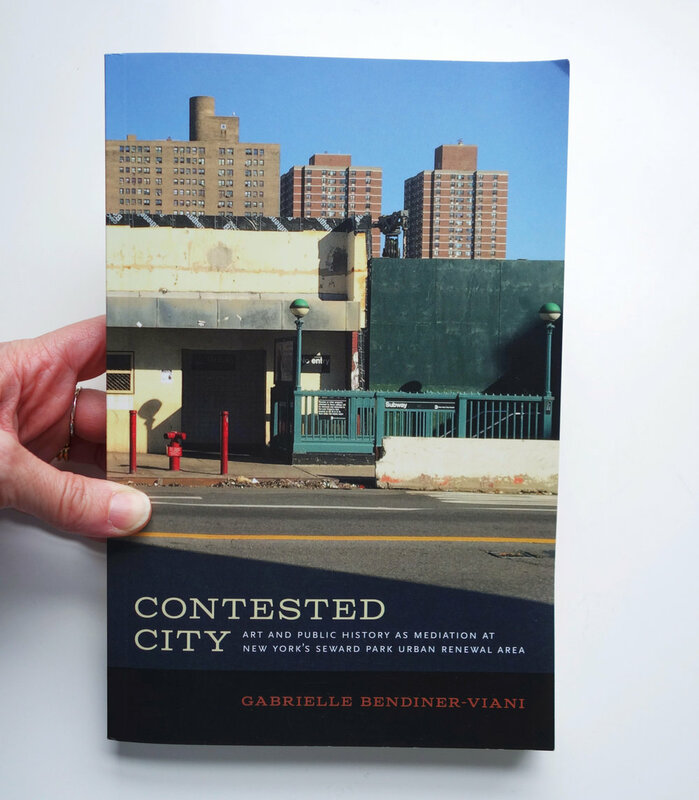 Your name — Gabrielle Bendiner-Viani — is on the front cover as the author of Contested City (rightly so!) But the work is exquisite, because you weave the community's voices of SPURA throughout the book. So that the community is not just being written about, but writing themselves into the work. I felt like I knew them all by the end of reading this. Can you tell me more about the process of writing this book — how you spoke to the many publics, the many communities that your work engages with? Some of this depth comes from the way the book emerged from “Layered SPURA”, a five-year collaborative project that I created with local community activists and my students through five years of my “City Studio” class at the New School. That project created five annual community-based exhibitions, tours, and events about SPURA as a place with a people’s history. This work meant that before I ever knew it was a book, the project incorporated and learned from a great many diverse community and public voices. And the many years of commitment meant that there was a lot of time for nuance, observing, listening, trust-building. On one of the coldest, iciest nights of the year, the Contested City book launch on February 12th couldn't have been warmer. My heartfelt thanks to the more than 100 of you who were there, and the many more who were there in spirit. It was an honor to share the night with long-time collaborators and activists extraordinaire, Damaris Reyes of GOLES and Tito Delgado of SPARC. Highlights included Damaris' surprise that our long collaboration could turn into a book, Tito's call for the public control of land for the people, Gabrielle's challenge to the City to use SPURA as an example and make all affordable housing permanent, and seven-year-old Eva's statement that while she wasn't interested when she arrived, by the end of the evening she was sure she wanted to read the book. Get a sneak peek at Contested City in this excerpt from Chapter 2 “Walking the City”, recently published by Public Seminar. Several years after my work in Brooklyn, Oakland, and the Vladeck Houses, I returned to the Lower East Side, this time as a professor of urban studies at the New School and director of Buscada, which combines art and research practices in urban neighborhoods. Marci Reaven, a historian and director of City Lore’s Place Matters project, took me on a walk as I was creating a community-engaged class for my first semester of teaching. Marci suggested that perhaps my new class could work with Place Matters and the longtime housing and neighborhood activists, Good Old Lower East Side, on their current project: SPURA Matters. On our thirty-minute walk, heading east from the New School on 12th Street, zigzagging south and eventually onto and across Grand Street, Marci began to tell me the painful stories of SPURA, stories of disappointment, displacement, and discrimination involving this failed urban renewal site. The awkward blocks of parking lots just north of Grand Street that I had unconsciously avoided when I worked at the Abrons Art Center suddenly made sense. The area was uncomfortable because it was unfinished. It was uncomfortable because it held pain and open wounds in its very fabric. And as we walked, Cherise and all the others from Artscape and those first guided tours came rushing back to me. So did my walks with my grandmother, my walks to meet my aunt at the diner on Grand Street near the school where she taught, and my childhood shopping forays with my mother to Orchard Street. I knew this place so well. Yet Marci was telling me another story, one I didn’t know at all. 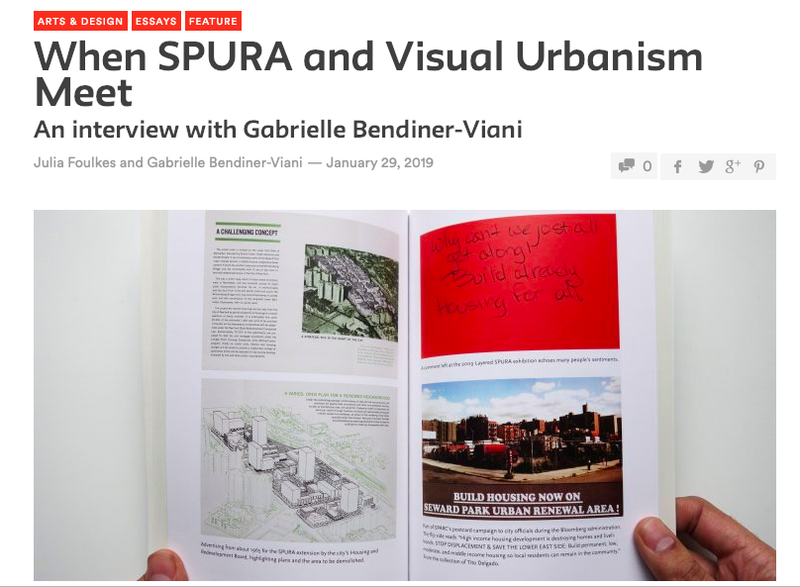 A great new interview with Gabrielle by Julia Foulkes in Public Seminar - on everything from disinvestment, to visual urbanism, to the possibilities of art, and the vagaries of social practice. Here’s an excerpt - read the rest here. GB-V: You could say that visual urbanism is the term I coined to explain to other people how all my jobs and life experiences make sense in my own head as interwoven parts of one commitment to understanding people and the meaning that places hold for them. It is also a way of working that argues that creative practices can be a way of knowing, belonging as part of urban research because they help us pose questions we might not otherwise know to ask. For me, this practice is also one that struggles against the often-uneasy relationship between text and image, and between imagination and fact. I am trying to create spaces, projects, and research where these ways of knowing are equal: the text does not caption an image, the image does not illustrate a text. Images, words, feelings, and histories are experienced together, each bringing a new facet of understanding or new voice to a conversation. I’m interested in this work as something that can act in the world, that can build on the accessibility of images to spur conversations and action in our complicated cities, neighborhoods, and homes. 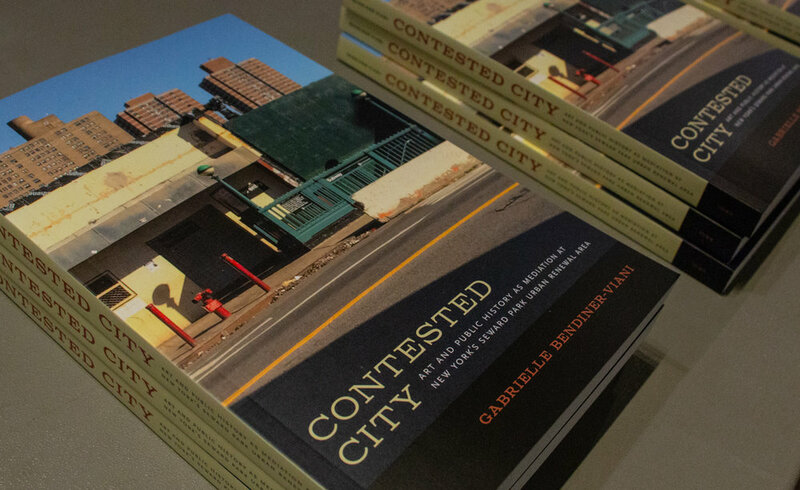 Contested City book launch, Feb 12 : RSVP here! Join us for the Contested City book launch! Free and open to the public! Revealing the untold stories of fifty years of community activism at the controversial Seward Park Urban Renewal Area on New York’s Lower East Side — now the site of the mega-development Essex Crossing — ContestedCity sheds light on the importance of collaborative creative public projects in this complex place. Bridging art, design, activism, and urban history, this is a book for everyone who seeks to make their own city more just. Great to have this hour-long interview about Contested City on WBAI! To celebrate the release of Contested City, Gabrielle had a great conversation with Alison Stewart on WNYC’s All of It. Listen below - interview at the top of the hour (after the reaction to the L train)! Today’s the day! Contested City is now out in bookstores everywhere, and available online at Indiebound, Amazon, and from the University of Iowa Press. Can’t wait to see these in everyone’s hands. As a nice extra, it’s also Amazon’s #1 in new releases in Public Art. Join us at the New School for a community gathering, book-signing, reading, and general celebration on February 12, 2019, from 7-9pm. Free and open to the public. RSVP here.